Have you heard of Pyle before? 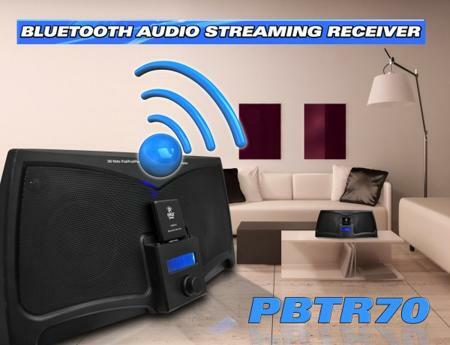 If it sounds very familiar to you but you are unable to place your finger on it, then you might be interested to know that Pyle is actually a manufacturer of home, car and pro audio equipment, and they have just launched the BlueReach (model number PBTR70), which so happens to be a Bluetooth wireless-based music interface. The BlueReach would come in the guise of a user-friendly adapter which will connect directly into a 30-pin standard speaker dock in order to convert to a wireless Bluetooth audio device, which would make the speaker play nice not only with iPhone 4/4s and its predecessors, but the most recent iPhone as well, the iPhone 5, not to mention the new iPad and other Android smartphones and tablets. The Pyle BlueReach’s main aim in life would be to transform your speaker into a virtually universal audio device, where it can connect with any Bluetooth-enabled tablet, phone or MP3 player. Those who are interested in bringing home the BlueReach can do so for $66.99 a pop. Of course, since this puppy would jive with Bluetooth connectivity, it will be limited to a range of 33 feet – optimally speaking, although you would do better the closer in proximity it is. As the BlueReach introduces wireless functionality while freeing up the user to maintain mobile device functionality such as emails, texting and internet use, users would also find the innovative plug-and-play interface a boon since all one needs to do would be to plug in the 3-inch receiver and play music sans wires via the home or while on the go. Not only that, the user would also be able to plug in any device which relies on a 3.5mm plug in order to stream music via Bluetooth. There is a three level LED illumination to indicate its status, and the BlueReach’s ability to operate outside of the Apple platform makes it a suitable partner for Android and Blackberry users.